BASI – The British Association of Snowsports Instructors – is the UK national training and grading provider for professional snowsport instructing and coaching qualifications. This means they are the governing body for ski instructors in the UK. Each country with a skiing industry has its own governing body, and different countries qualifications are recognised in different areas. For example, Canadian qualifications are well recognised in North America, but not in Europe. BASI have worked hard to ensure that it’s qualifications are recognised the world over including Europe, Australia and New Zealand. They have done this by ensuring their exams and assessments offer equivalence to other training systems. To help them do this the BASI system is split into 4 Levels. Each level offers a professional qualification and the remit for work offered as well as the pay increases exponentially. BASI Level 1 is the the entry level of the pathway and must be completed before it is possible to progress through the system. The 5 day exam is an introduction to the methods and terminology of BASI. This gives you a foundation to build your instructing abilities on. To complete BASI Level 1 you will also need to complete 35 hours of shadowing, Outdoor First Aid, Child Protection Module and have a clean Criminal Record check. 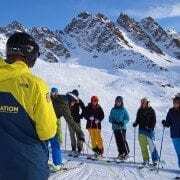 Whilst the entry level for BASI the Level 1 is still a professional qualification and with it you will be able to work in UK snowdomes and dry slopes, and on some nursery slopes in Europe and the UK. With the level 1 you can expect to earn around £8 per hour. BASI Level 2 is the “gateway” qualification – this allows you to work in a mountain environment in most parts of the world. The exam is a 10 day on-snow training and assessment and an additional 35 hours of shadowing. As the Level 2 now qualifies you to teach in a mountain environment many students stop here. BASI Level 2 instructors can work for a few seasons or just during the holiday weeks. In Switzerland you can expect to earn about 20 Swiss Francs an hour. 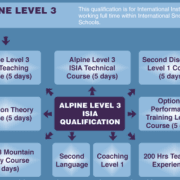 BASI Level 3 holds the ISIA (International Ski Instructor Association) stamp and is regarded as the highest level of ski instructor qualification in many parts of the world. It is a big step up from the Level 2: trainees move away from a single exam into modular assessments. With 8 separate elements including; Teaching Exam, Technical Exam, Second discipline (ie snowboarding, adaptive etc. ), Mountain Safety, Second language, Coaching Level 1 and 200 hours of teaching experience. Once completed your efforts will not go unrewarded, and those holding this qualification can really make a career out of ski instructing. With wages increasing by around 20% and the chance to teach both on and off piste. BASI Level 4 is the final rung on the BASI ski instructor qualification ladder. It holds the highest level of worldwide recognition as an International Ski Teaching Diploma (ISTD). This is recognised everywhere in the world. Completing this is no walk in the park: to get from Level 1 to 4 takes an average of 5 years. Like the level 3 the level 4 is made up of separate modular assessments including; Teaching Exam, Technical Exam, European Mountain Security (including training course, logged tours and exam). Level 2 Coach, BASI Interview, Written project and the infamous Euro Speed Test. With all of this in the bag, however, you can really make a career out of the sport you love. Hourly wages tend to be between €40 and €60 and you are sure to be in high demand. Once you hold your BASI Level 4 the ski world is your oyster! So who are BASI anyway? They are the overall governing body for British snow sports instruction. They manage the assessments and qualifications, and work hard behind the scenes to make sure everything above is possible. As the governing body there are also additional perks to being a member including insurance, continued professional development and career progression opportunities (such as becoming a trainer and assessor for BASI). So in short who are BASI – they are kind of a big deal. If you want to find out more about how you can achieve these qualification check out the courses we have on offer or come and ski with us this summer for free at our open days.